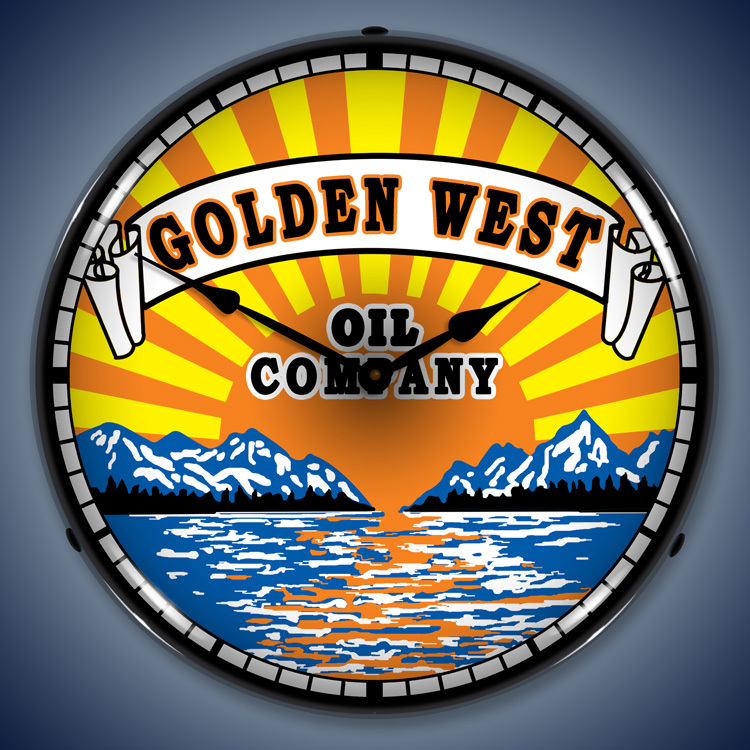 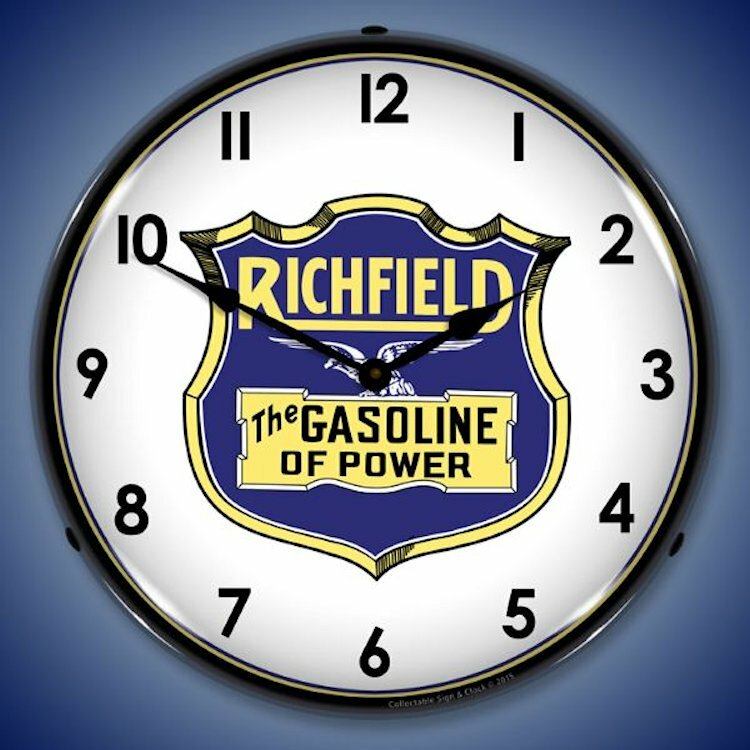 The lighted clocks on this page pay particular tribute to the classic gas and oil service that has long been a tradition in this country. 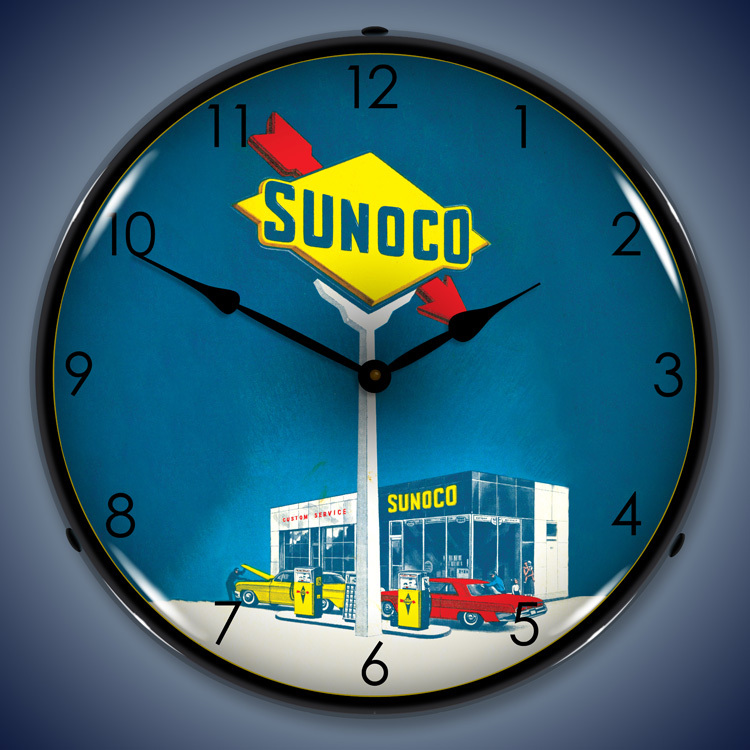 Each of these gas and oil clocks are brilliantly colored examples of Americana. 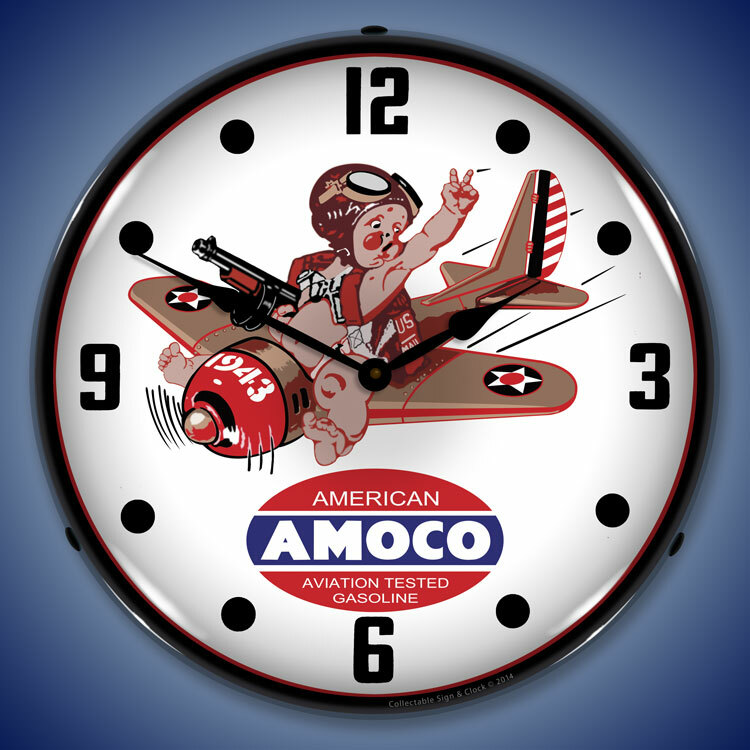 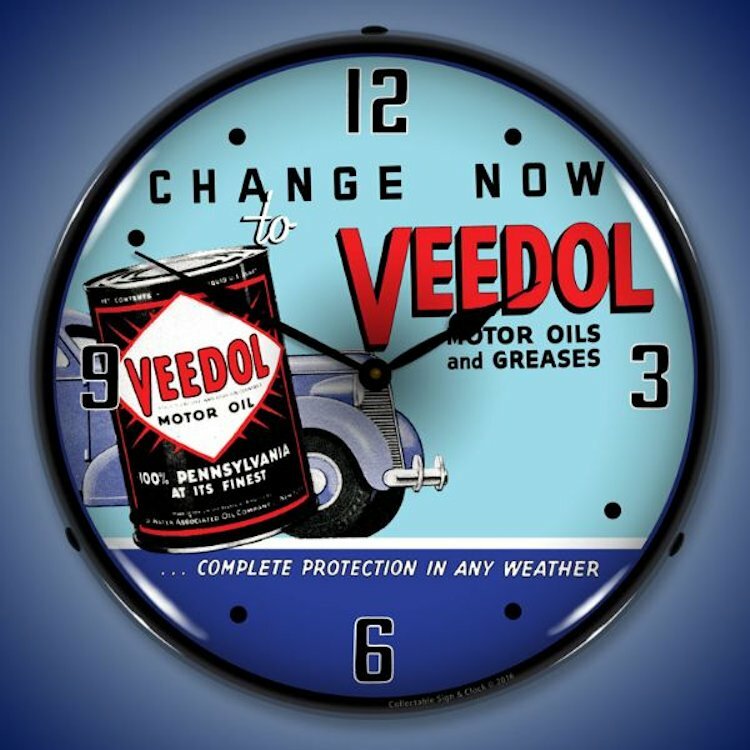 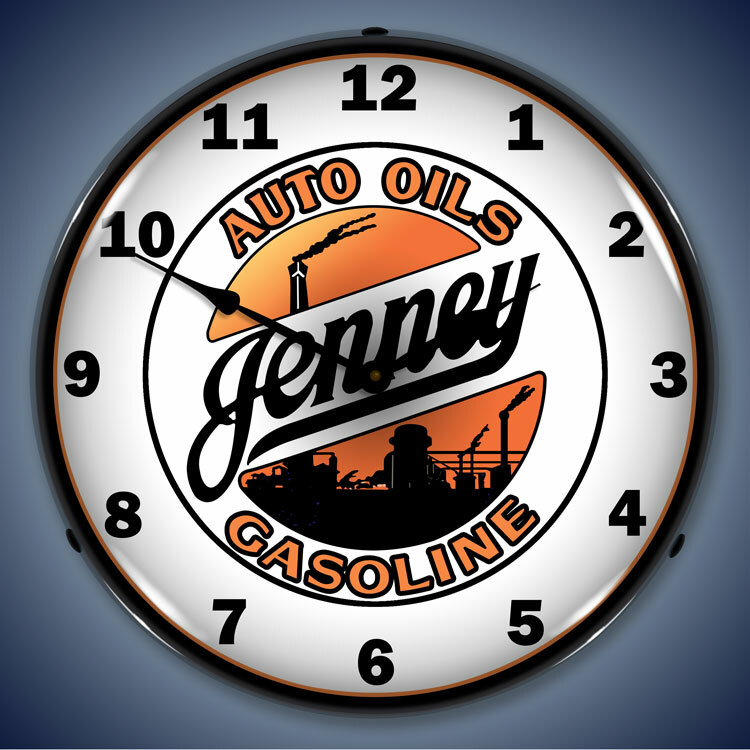 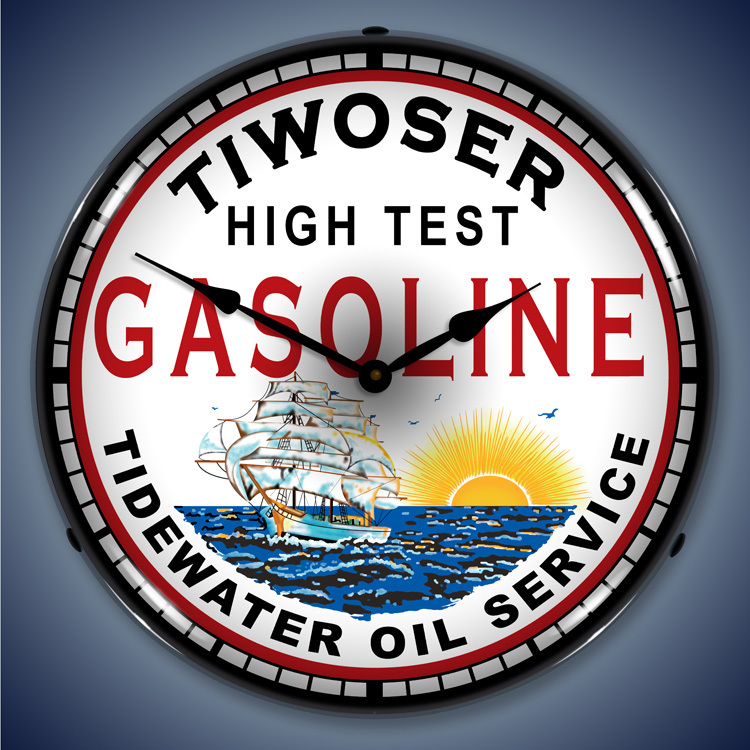 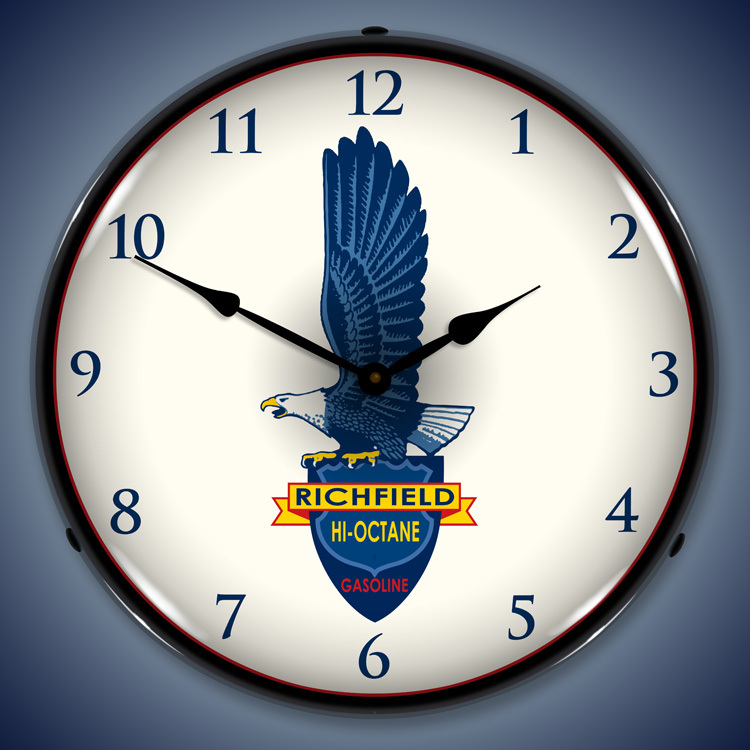 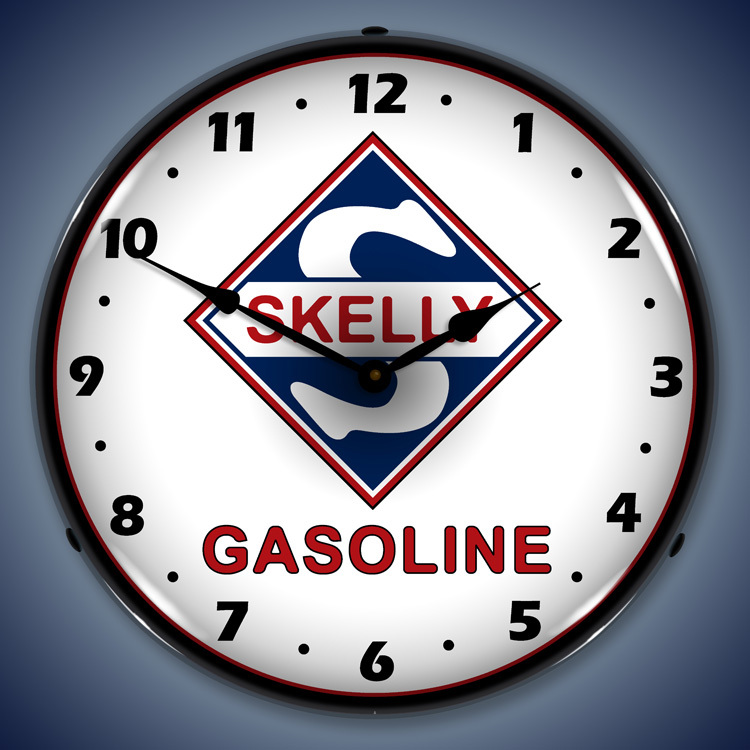 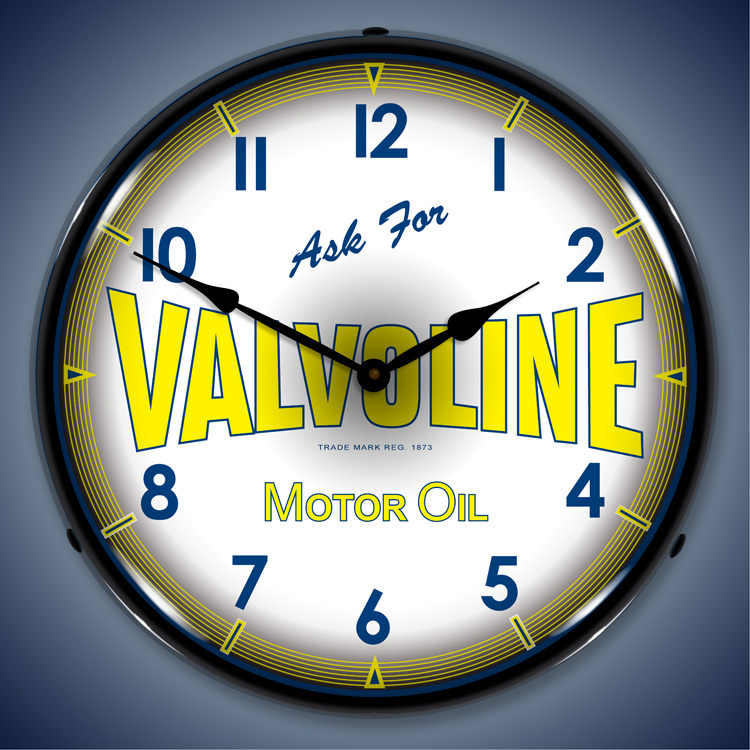 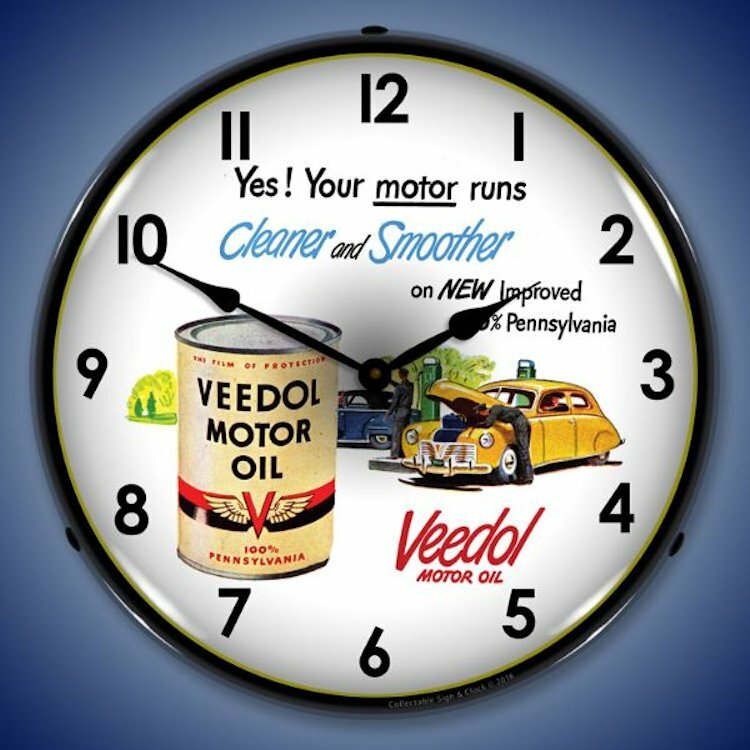 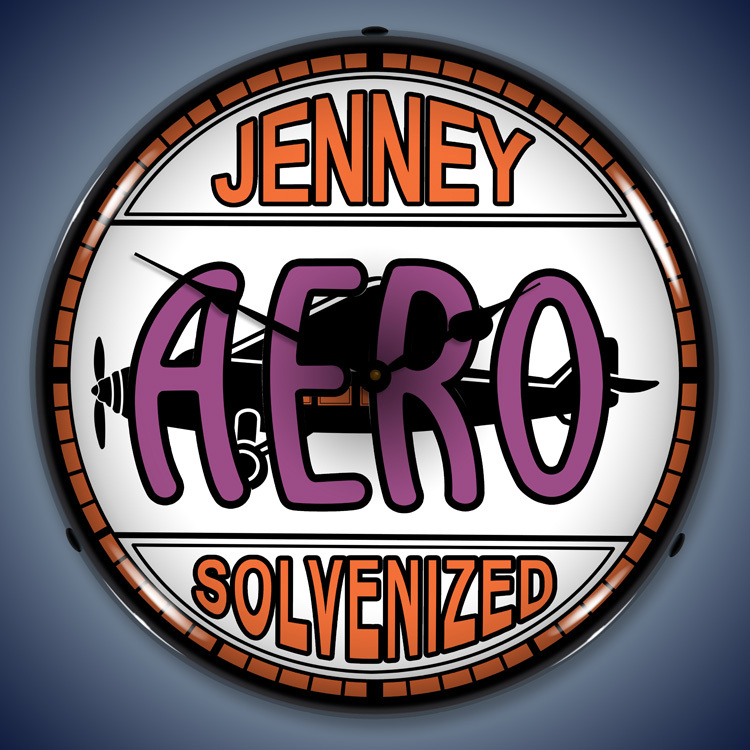 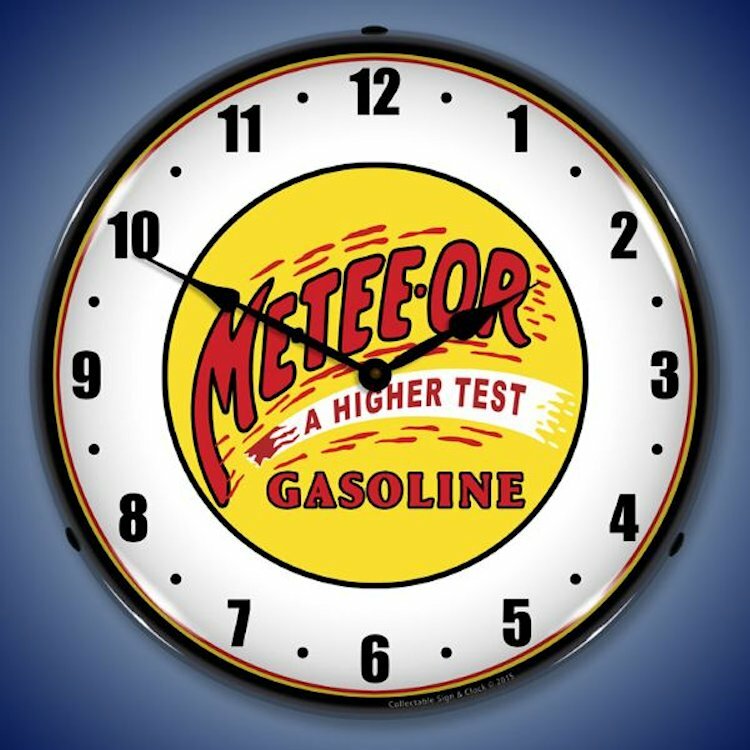 From images that represent well-known names like Valvoline, Amoco and Mobil to lesser known, but equally important to auto history franchises, like Richfield, Esso and Jenny Gas, there are bits and pieces of memory on the face of each time piece. 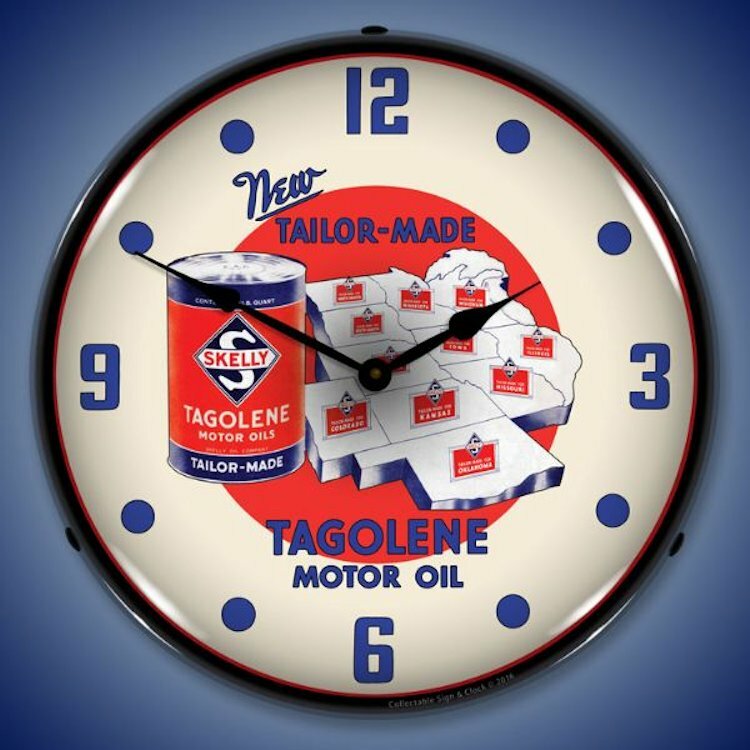 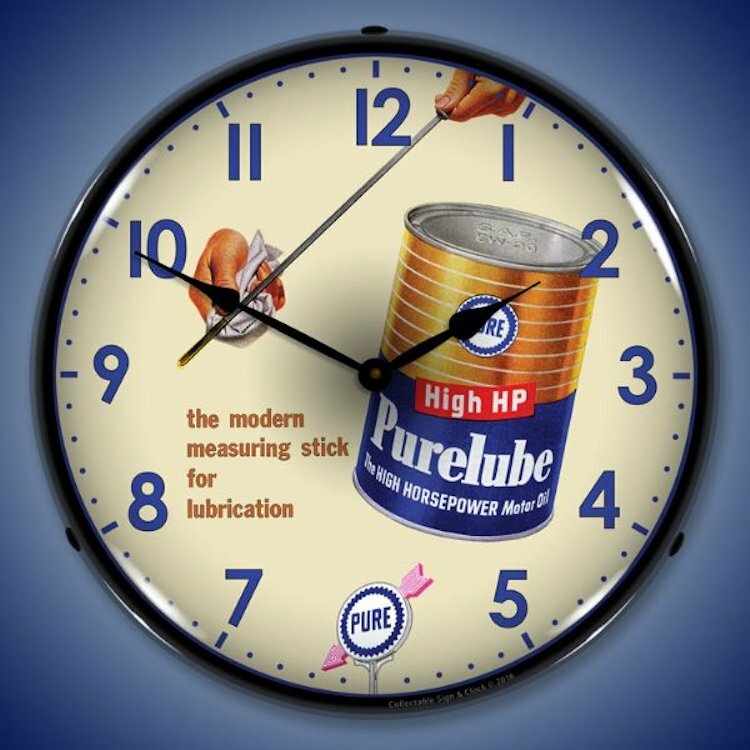 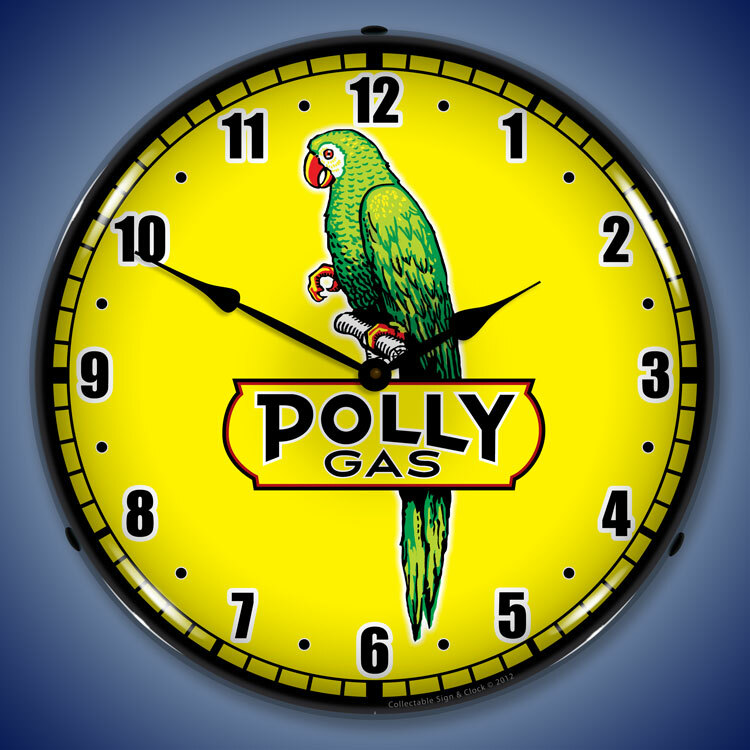 Each image on these gas and oil clocks was created from a classic work of art, generated with a distinctive UV drying, computer controlled process that ensured rich, lasting color. 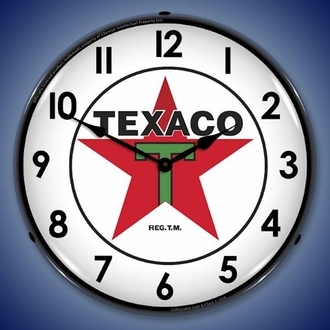 They are all 14 inches across and as slim as a wall clock gets at a thickness of four inches. 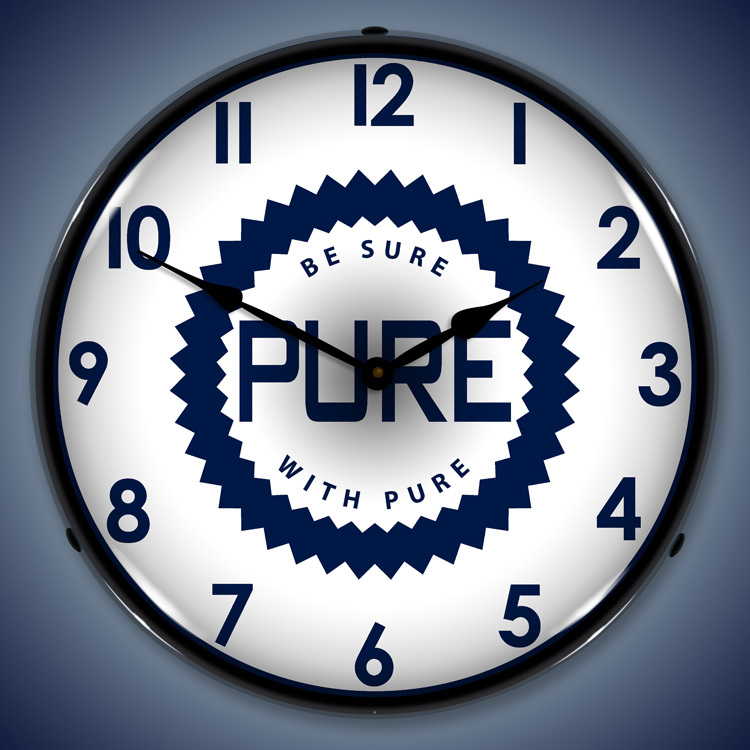 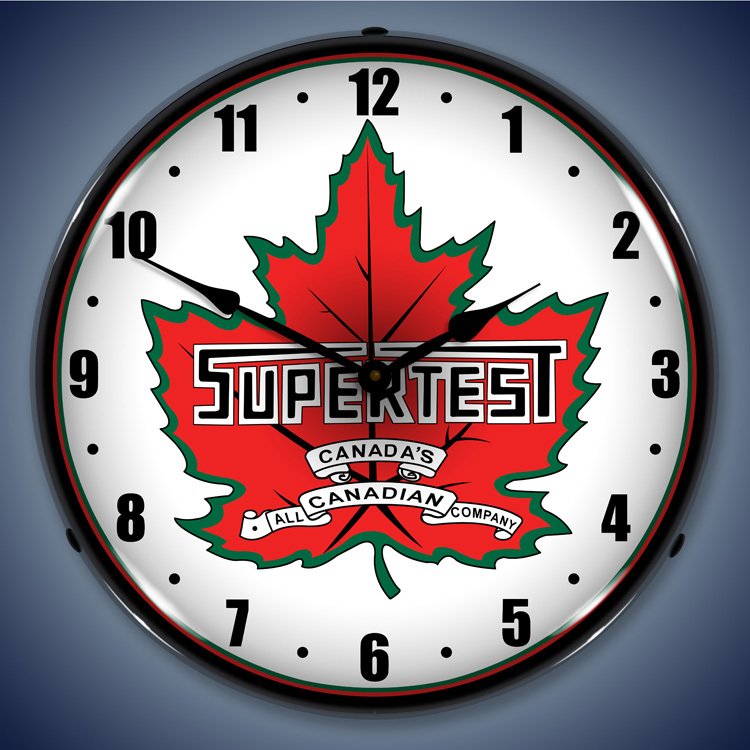 Engineered from a durable ABS plastic and an outer lens of clear optical Lexan, each time piece is as tough as nails. 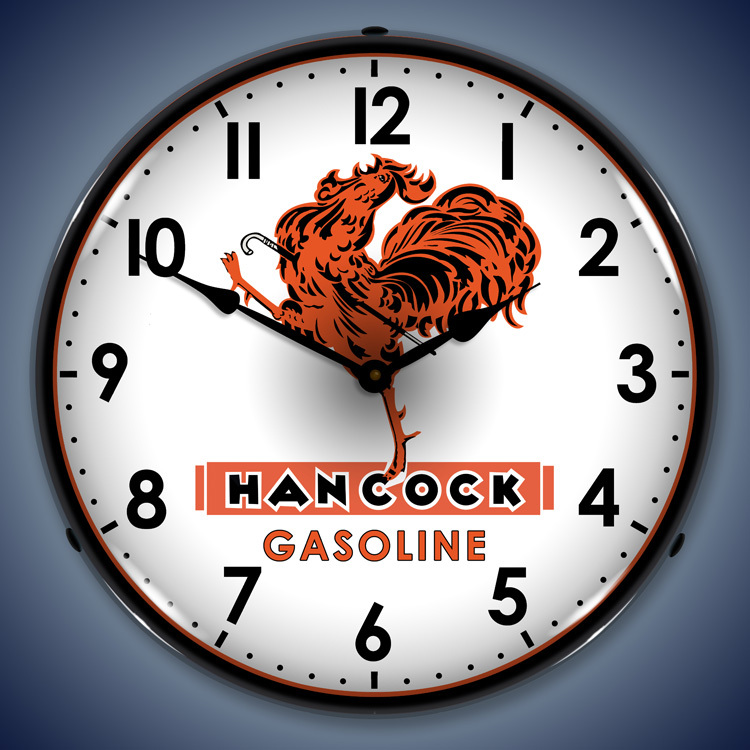 Each piece has a soft fluorescent light that promises to highlight the soft blues, sharp reds and detailing. 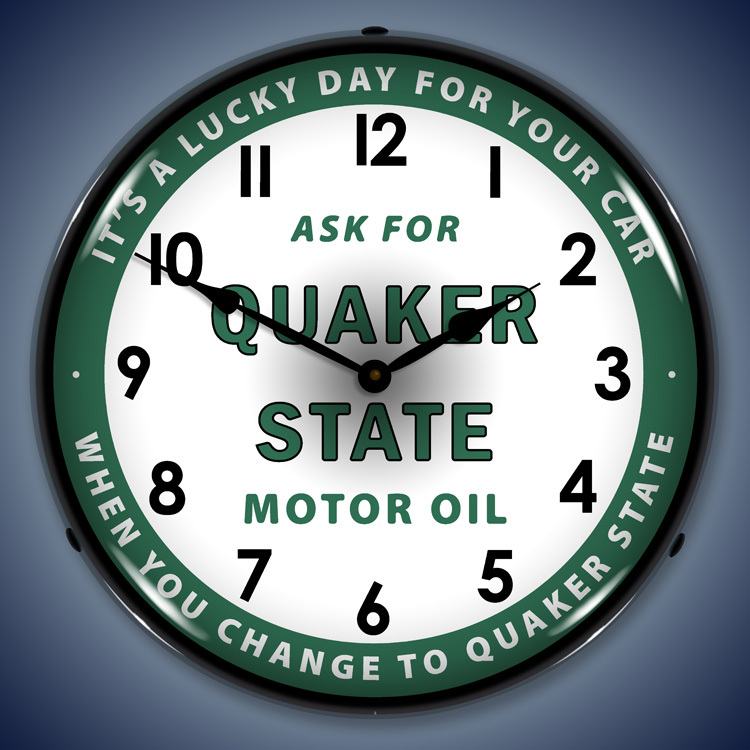 It�s powered by an off/on switch on its standard wall outlet plug. 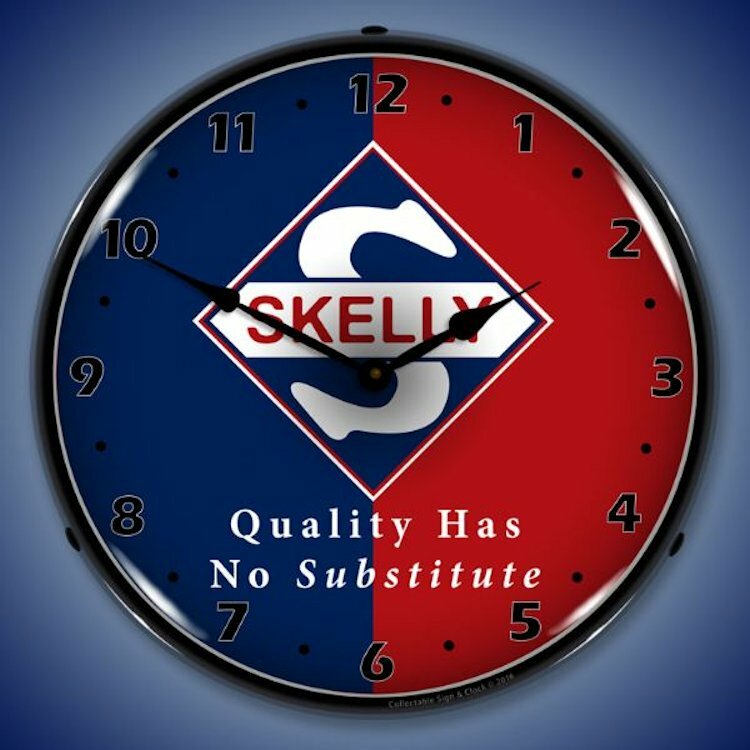 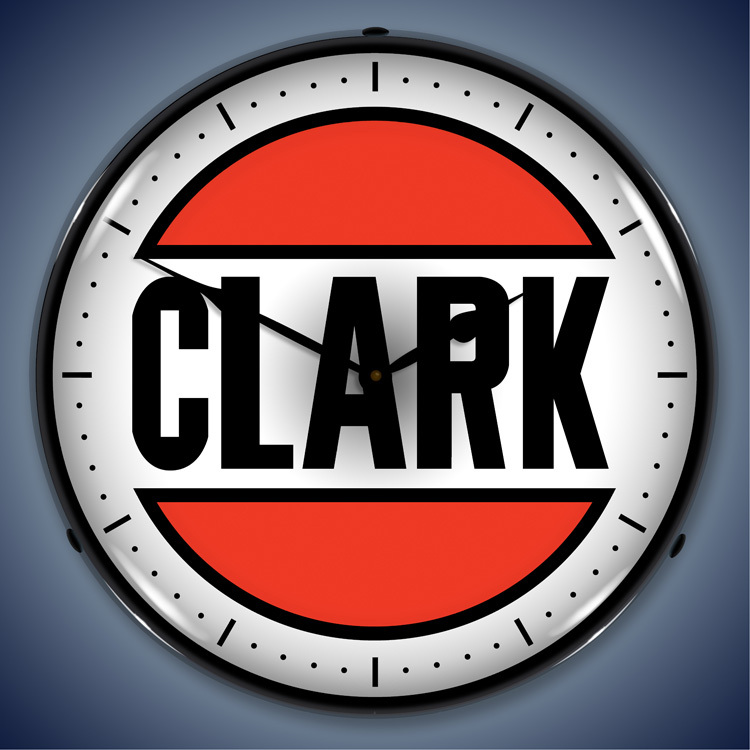 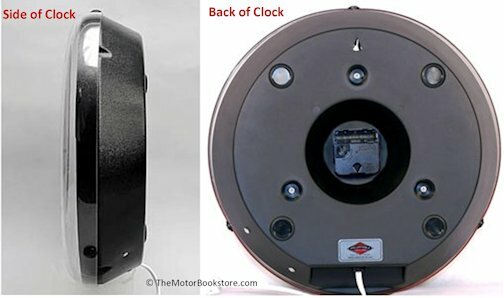 The clock itself runs on a single double-A battery. 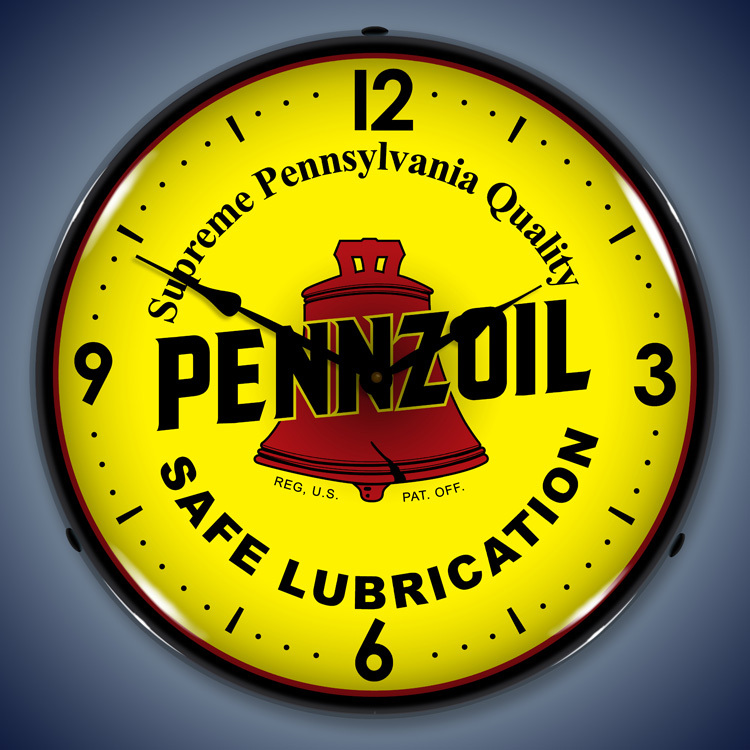 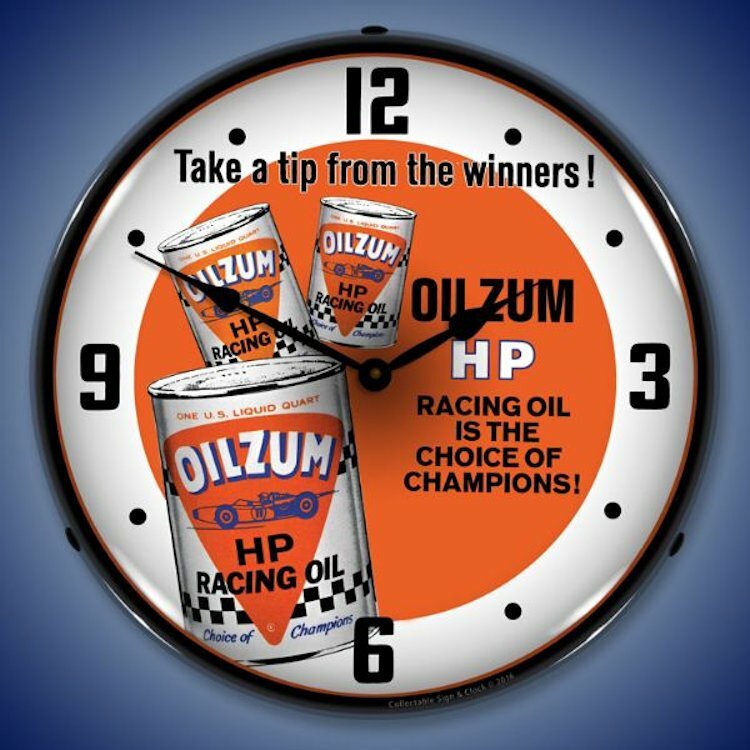 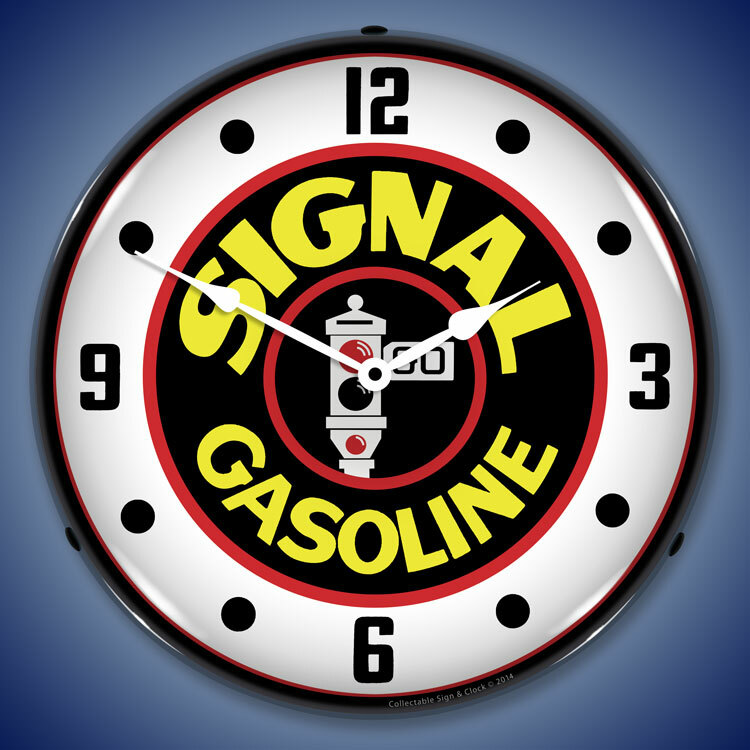 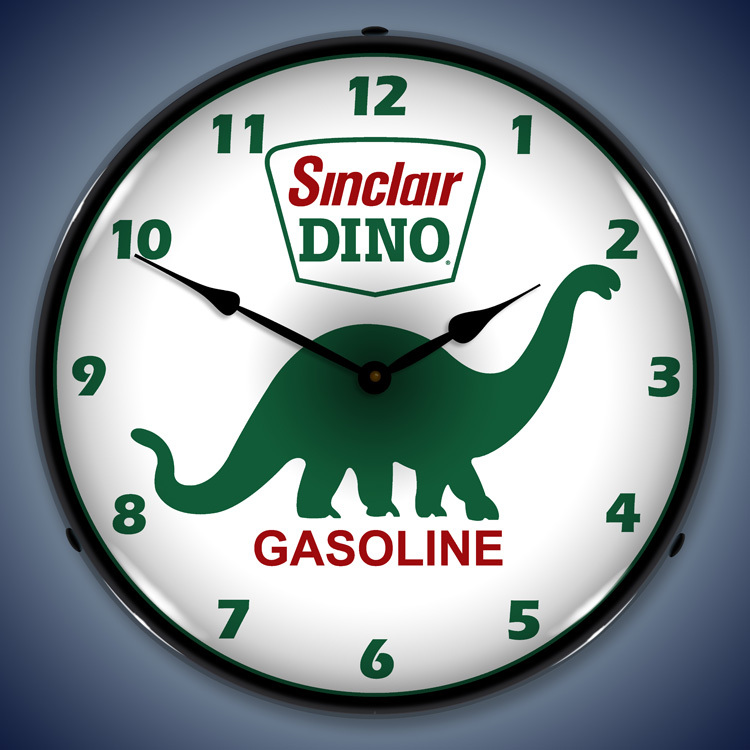 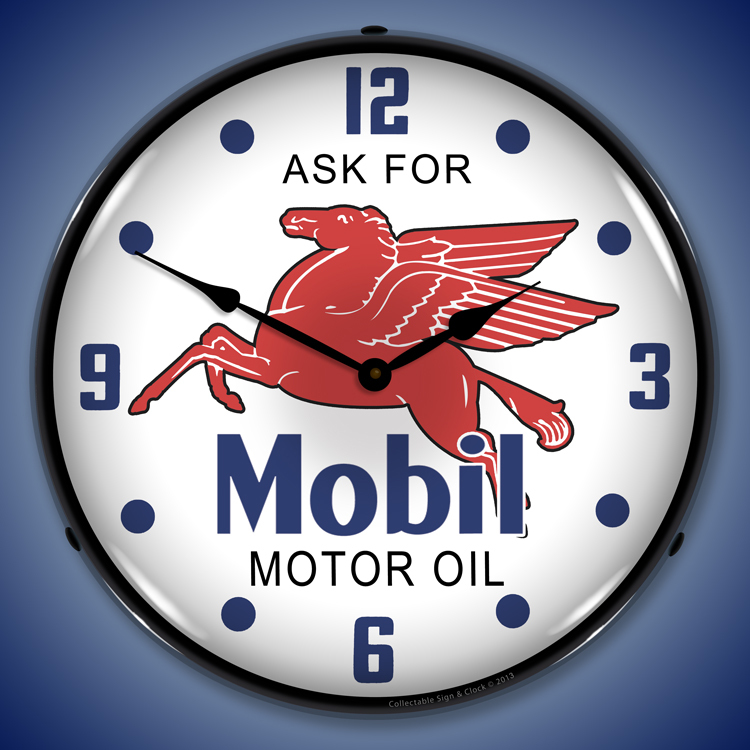 These gas and oil clocks make great gifts for the lover of vintage art and cars. 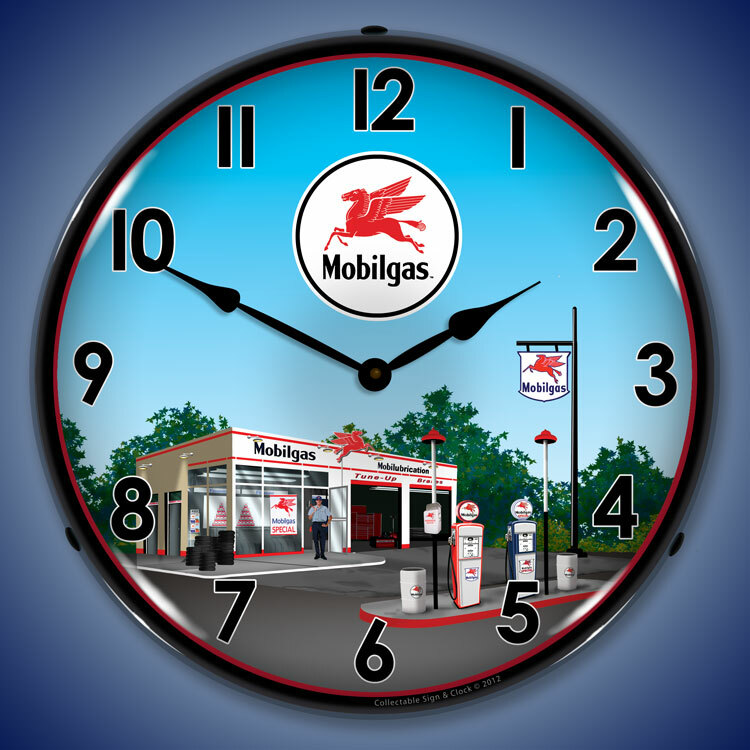 In bulk, businesses can use them as giveaways or promotional tools. 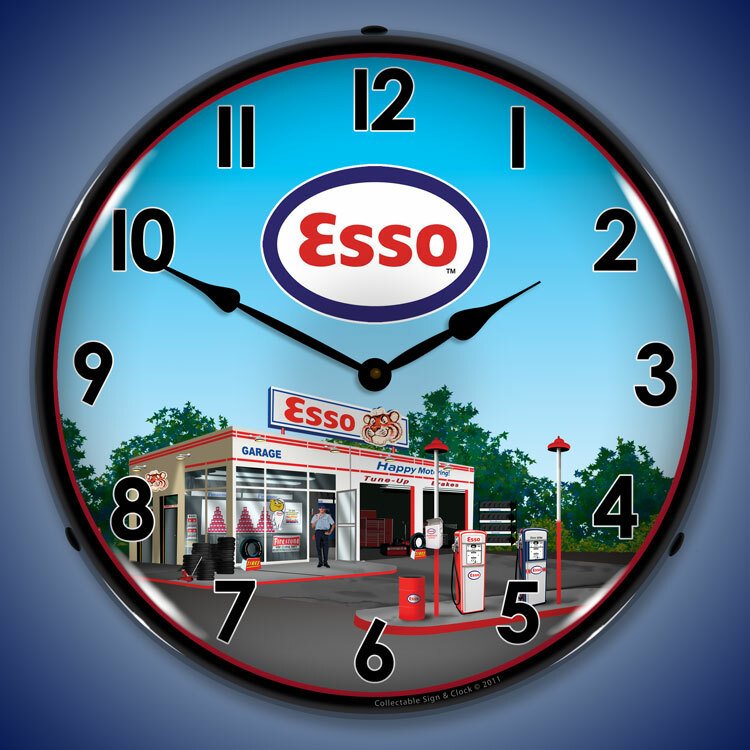 They�ll make excellent additions to any car club, gift shop or social club. 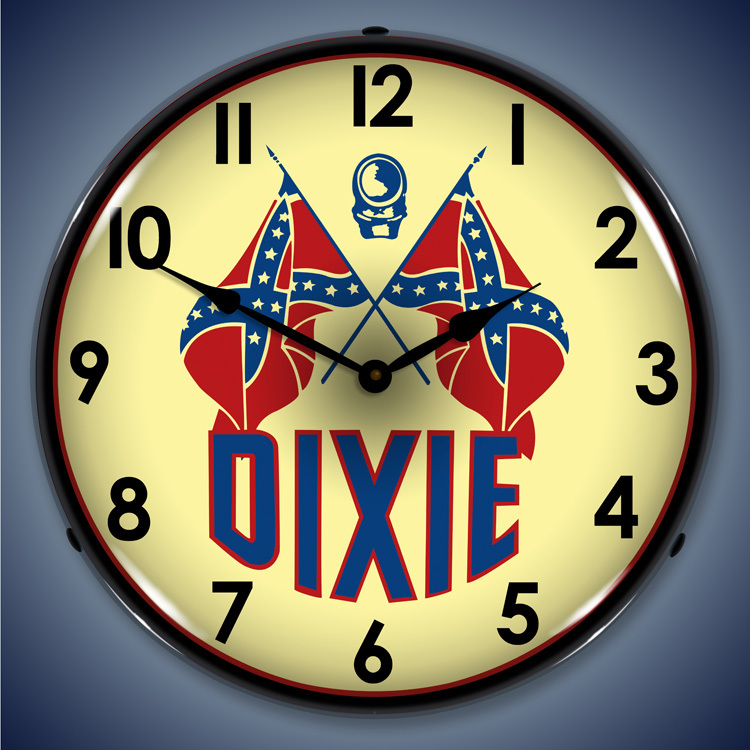 Put them on a diner wall or hang them proudly in your man cave. 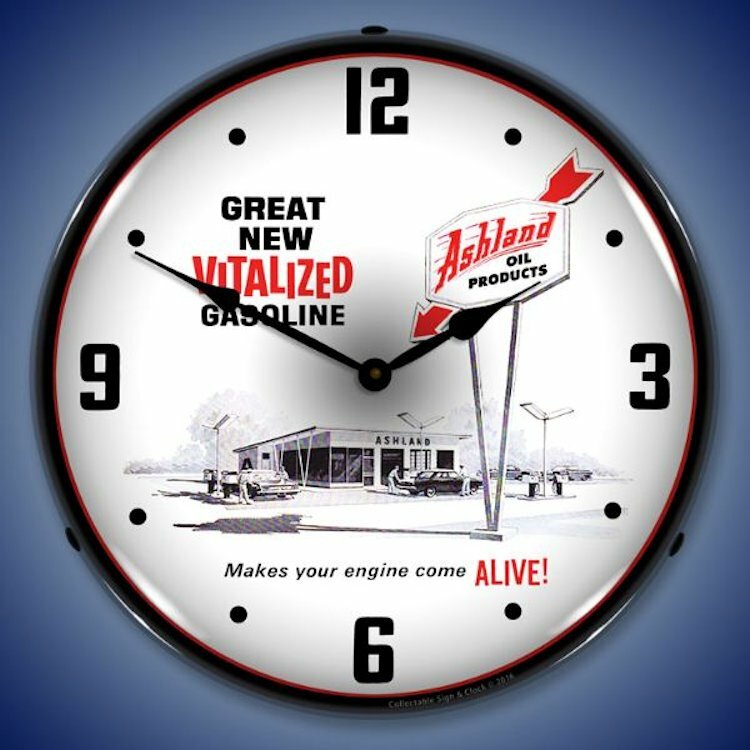 These are memorable images that have and still sprinkle our landscape of roads and highways. 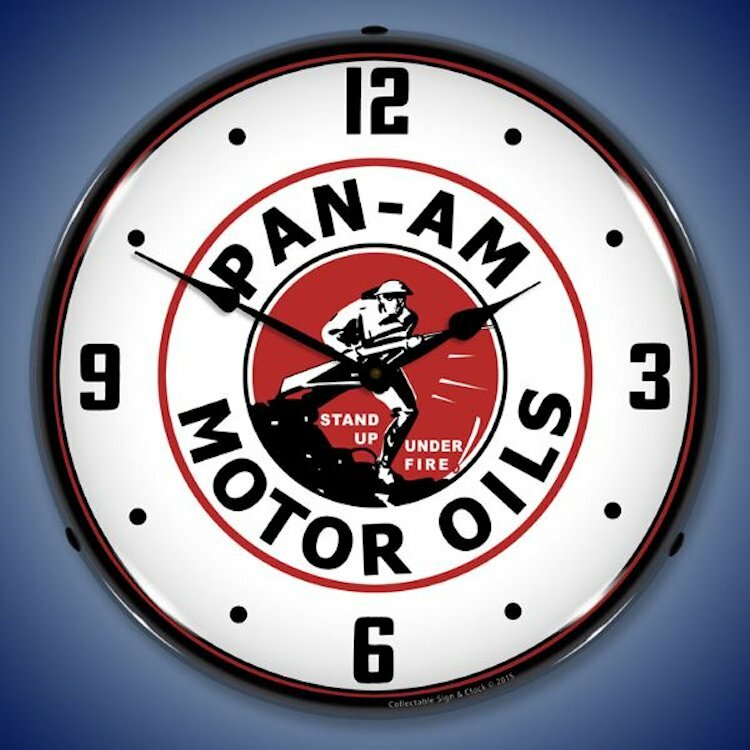 Grab a piece of road stop history. 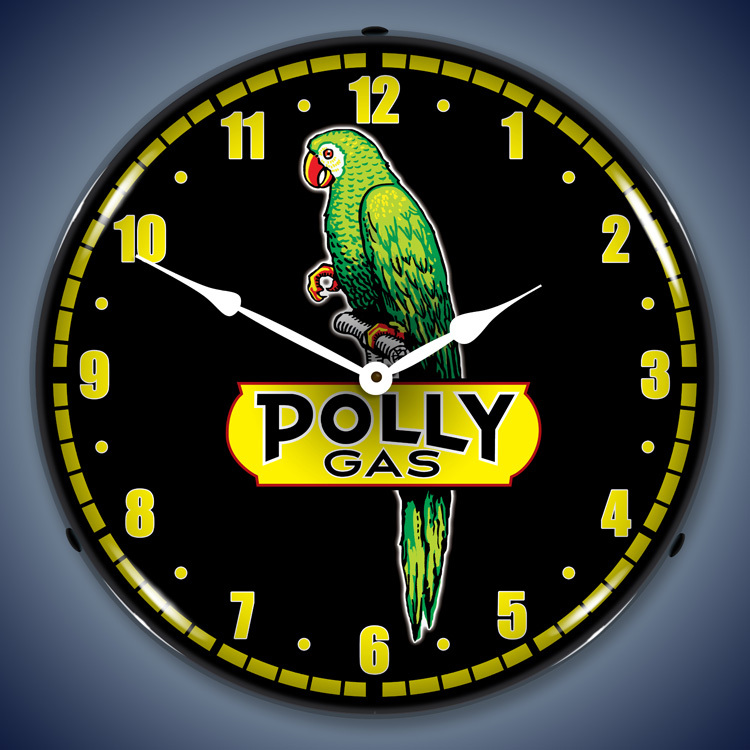 Whether or not you remember Polly Gas and Mohawk or Union 76 and Skelly, and even the more familiar ones that we still see all the time, like Texaco and Chevron, these are great pieces for everyone! 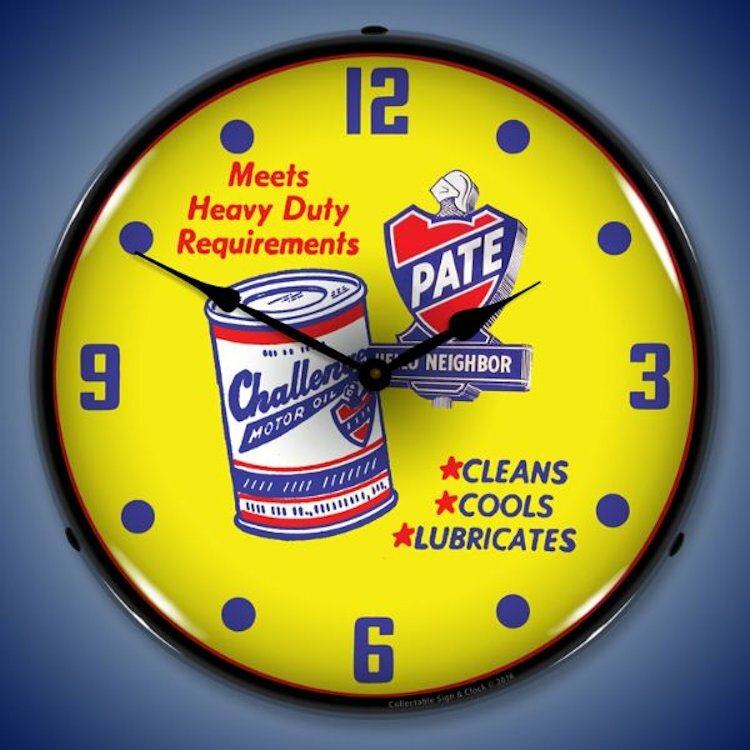 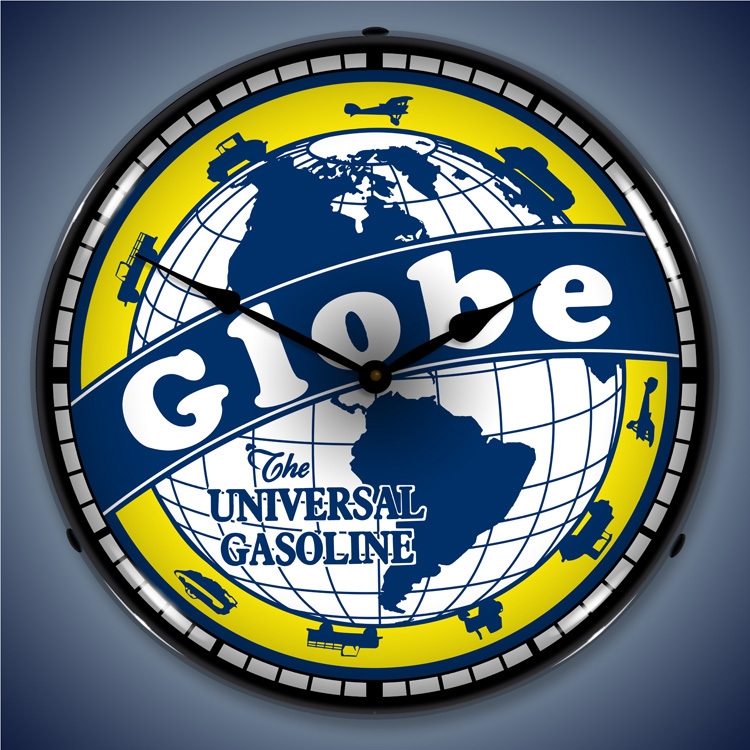 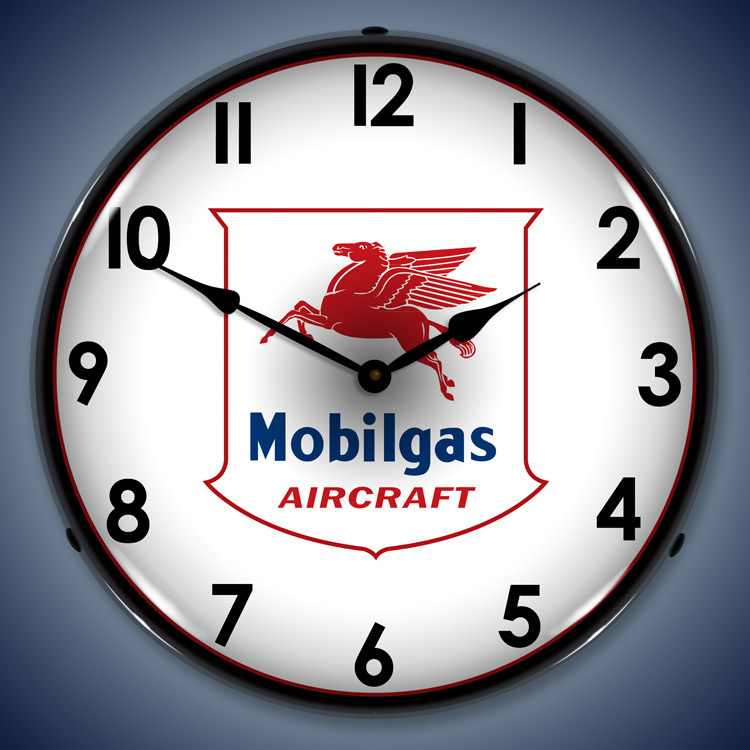 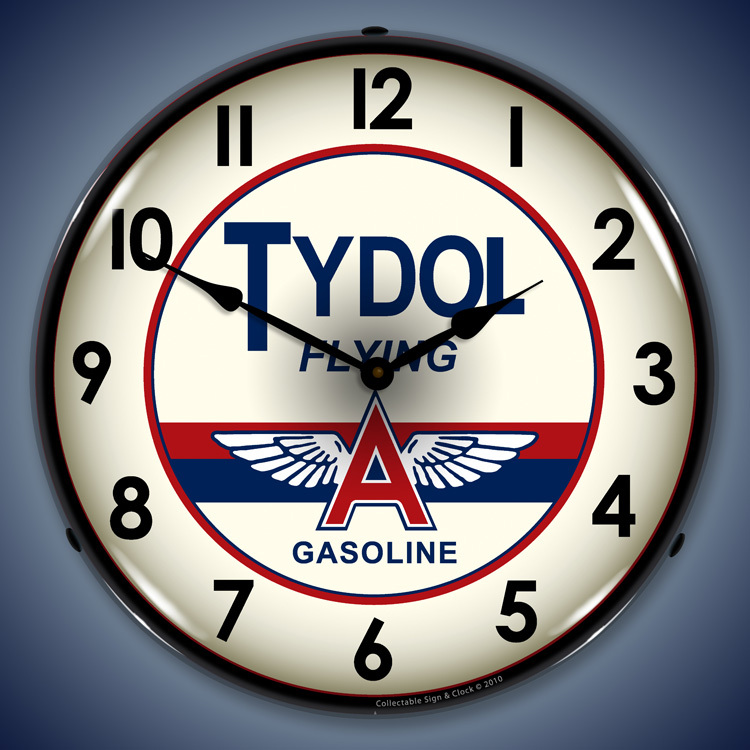 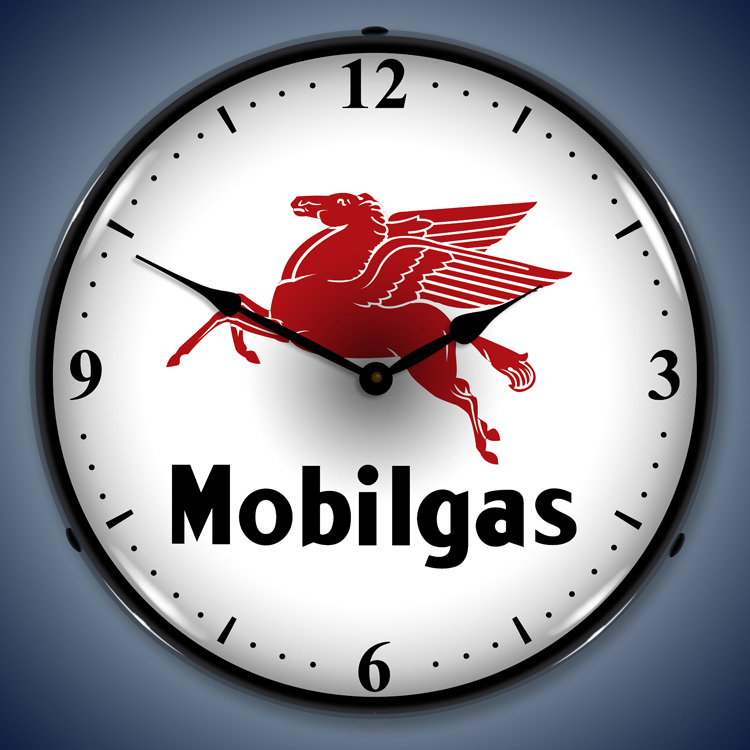 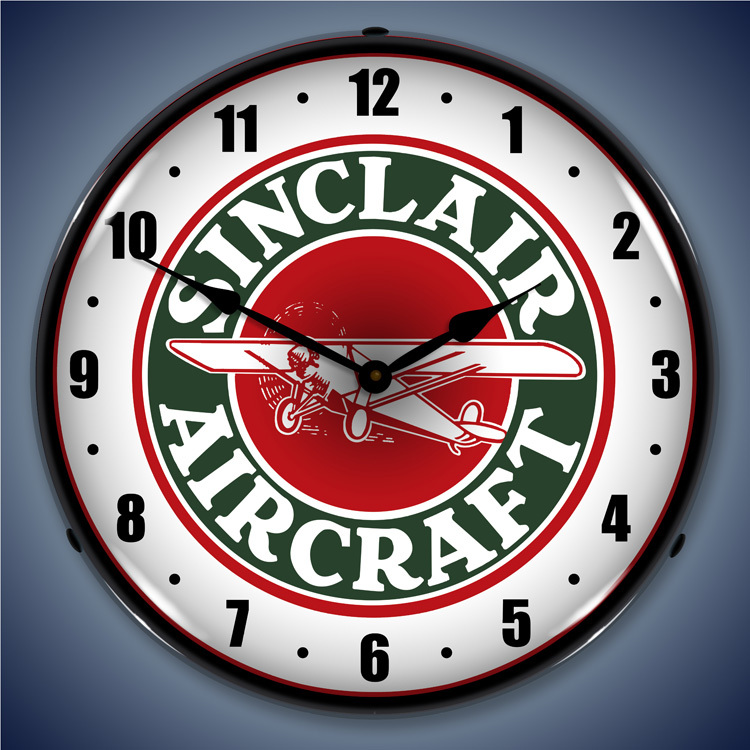 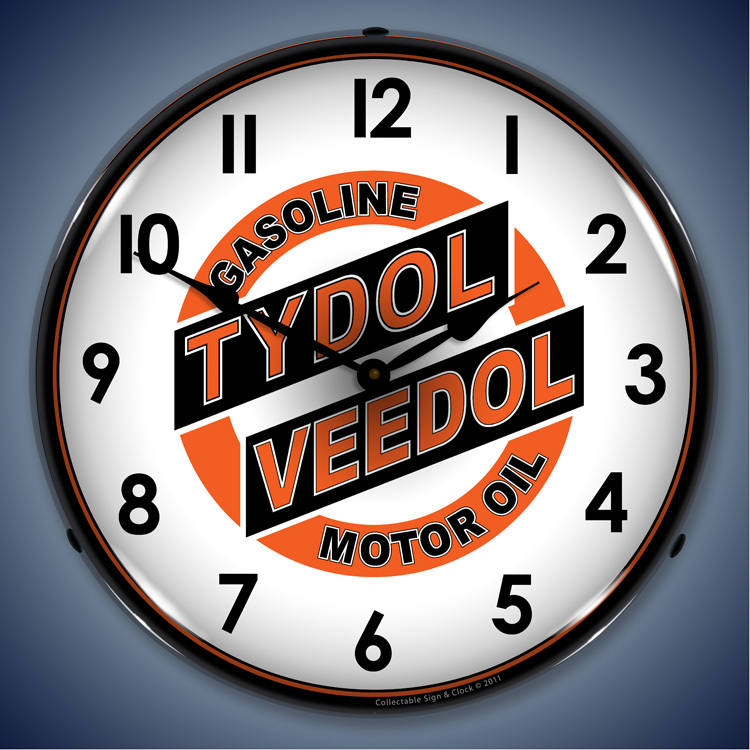 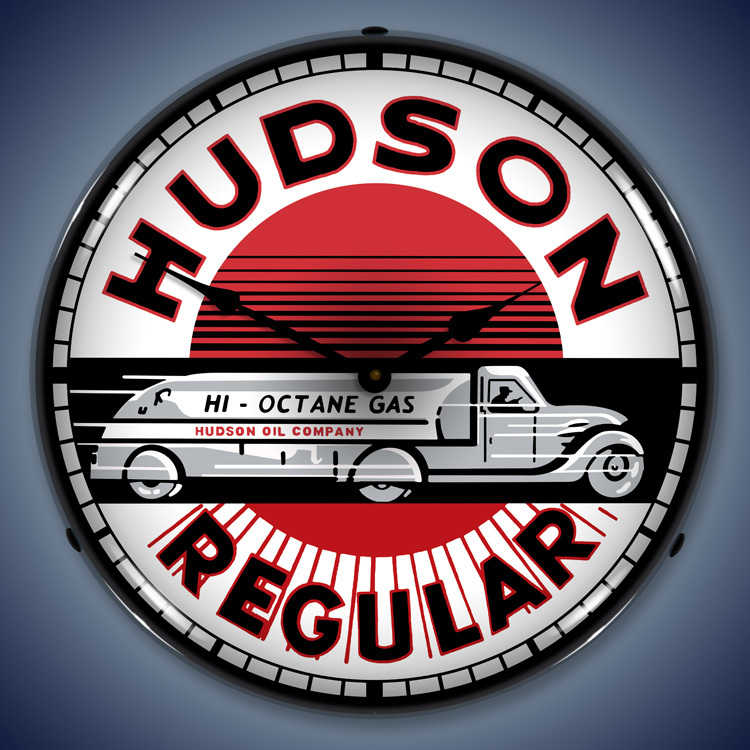 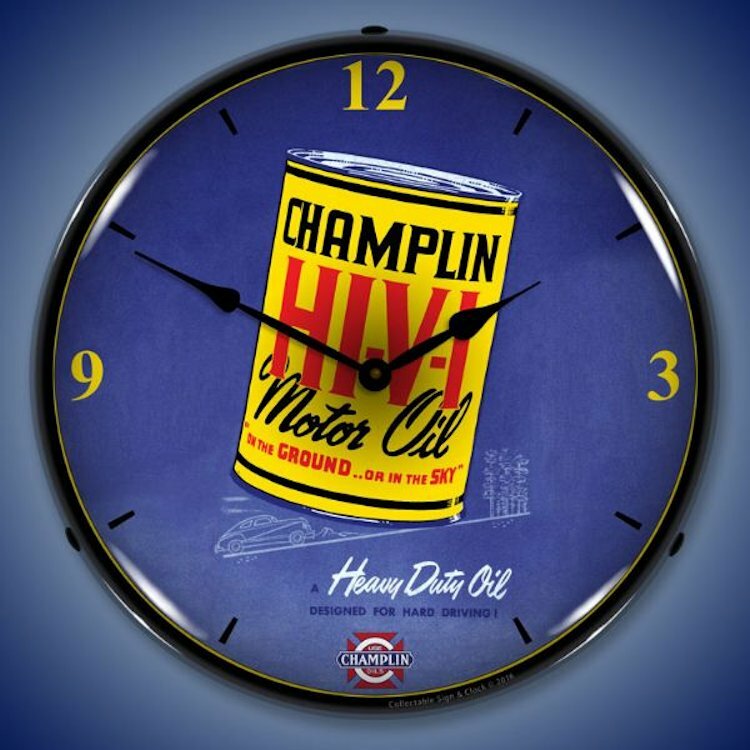 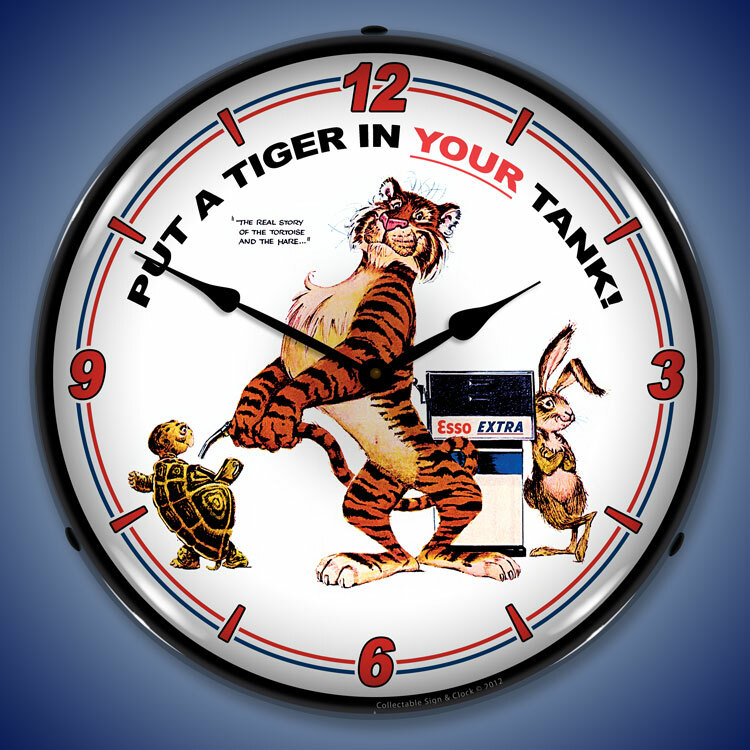 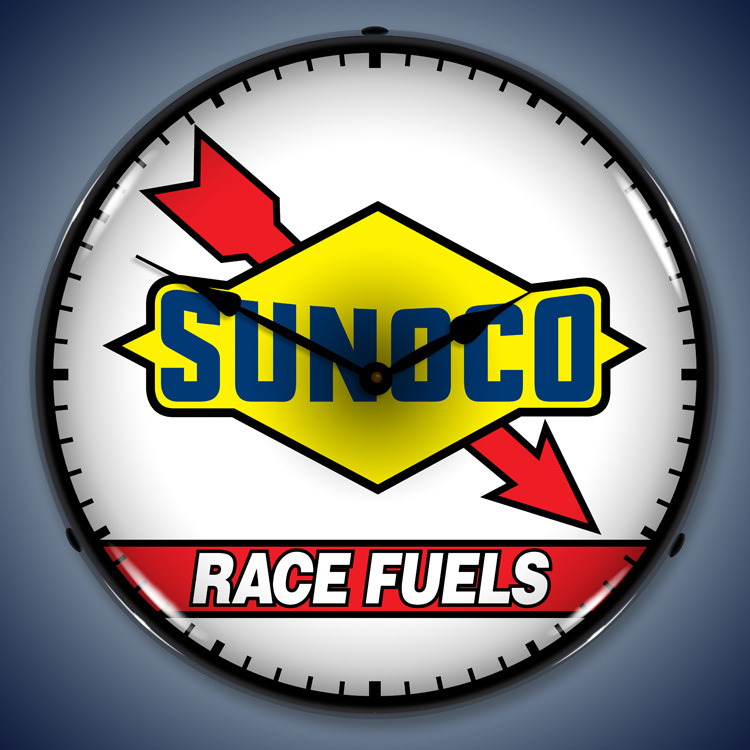 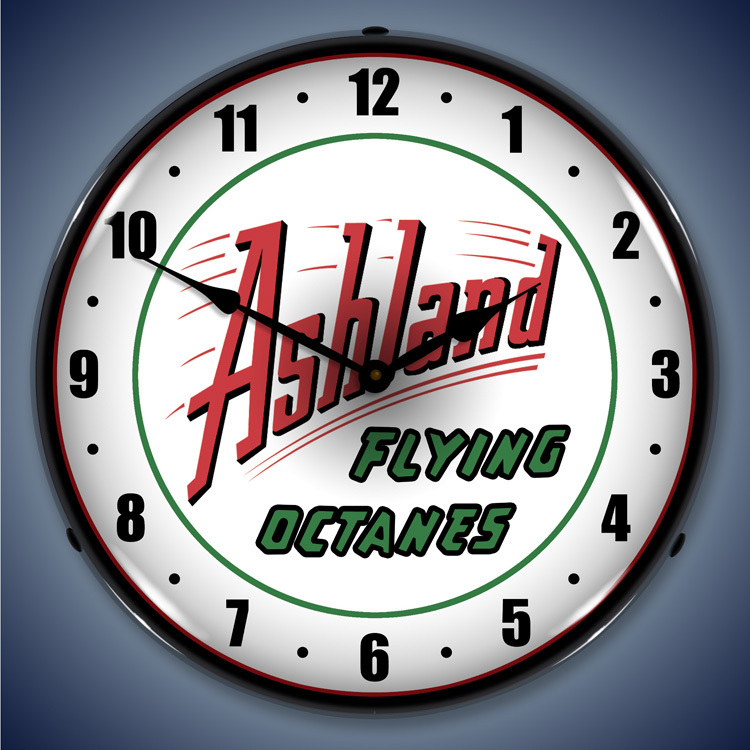 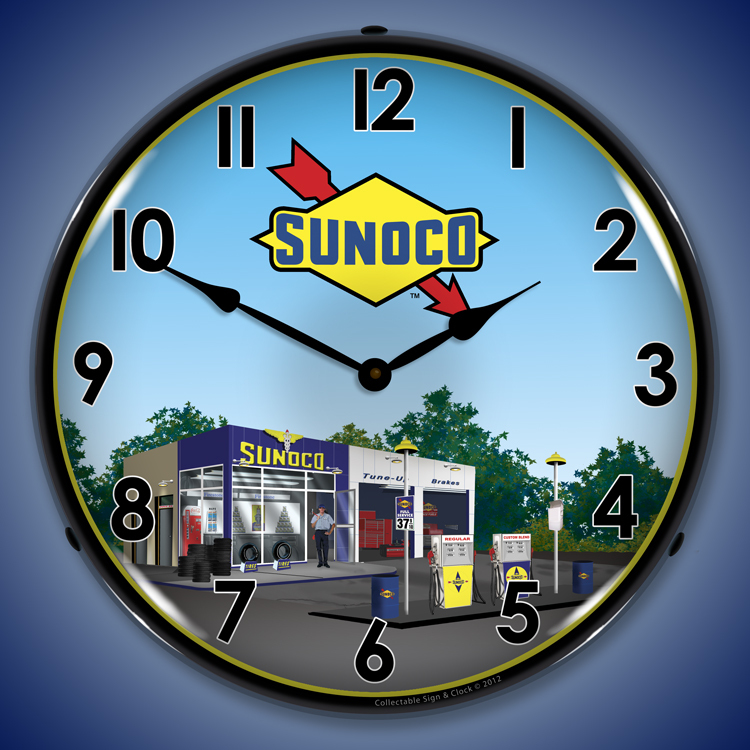 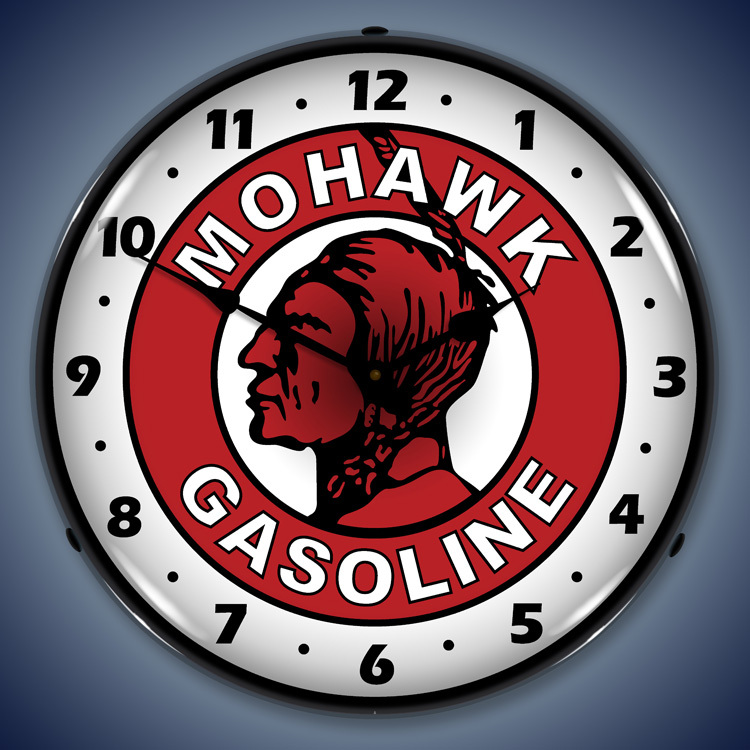 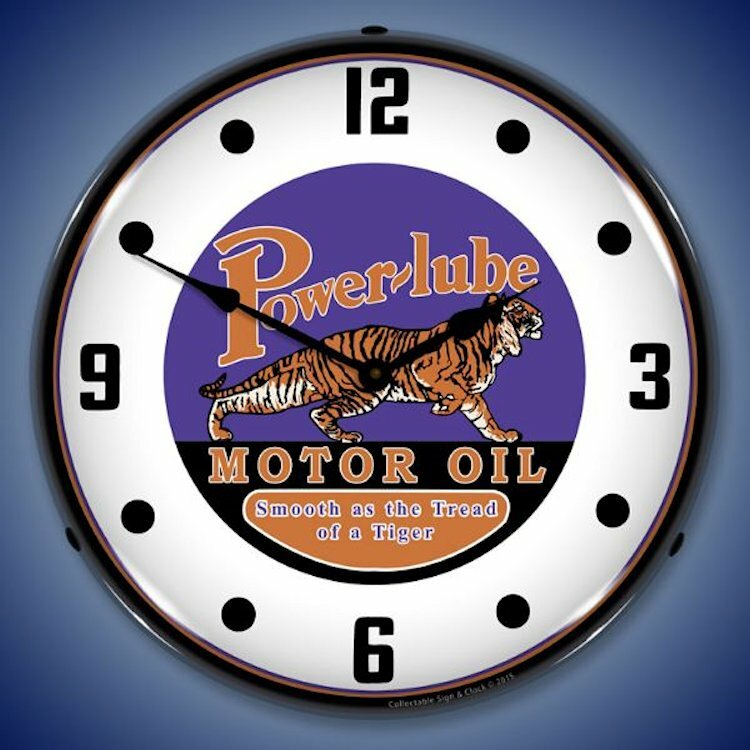 Subject: Vintage Gas Station and Motor Oil Wall Clocks: Amoco Aviation, Ashland Gas, Chevron, Clark, Conoco, Dixie Gas, Esso Station / Tiger, 1957 Gilmore Gas, Globe Gas, Hancock Gas, Hudson Gas, Jenny Aero, Jenny Gasoline, Kendall Oil, Mobil Oil, Mobilgas, Mohawk Gasoline, Pennzoil, Polly Gas, Pure Oil, Quaker State, Richfield Gas, Signal Gas, Sinclair Gas, Sunoco Gas, Super Test Gas, Texaco, Tiwoser Gas, Tydol Gas, Union 76 Gas, and Valvoline Motor Oil.